The order of the “Santa Casa de Misericórdia” was established in Portugal by Queen Leonor of Lancaster, in the year 1498. The main objective of the practice of charity was divided into four main branches: treat the sick, sponsoring the prisoners, relieve the needy and support the orphans. The “Irmandade da Santa Casa de Misericórdia de São Paulo” is a private institution and it is the largest public hospital complex in the city of São Paulo. It was the first medical school of São Paulo’s state, hosting both public universities (Universidade de São Paulo and Universidade Federal de São Paulo) there are on the city, until their hospitals were ready. In 1963 the “Faculdade de Ciências Médicas da Santa Casa de São Paulo” was founded , with a different view of Medicine. The main objective of this new university was to graduate a medical doctor that knows how to handle patients from the beginning, valuing the person – the human part, not just the disease. After graduation, the medical doctor can do a residency in the following areas: surgery, clinician, pediatric, orthopedic and minor areas. The university takes place inside of the hospital, so the student can have more contact with the patients. Beside the hospital, there is another building that belongs to the University, and in there the student has a library (both traditional and digital), internet access, class rooms, the secretaries of different courses and a Bank (ATM and agency). Inside the hospital the students can visit the different wards and they also have classes in the amphitheaters in there. There are 2 cafeterias, one with wi-fi internet access and also a refectory. It is located at 112 Dr. Cesário Motta Junior Street at Santa Cecília neighborhood in São Paulo. This hospital complex attends 5000 people each day in all medical specialties, there are 770 hospital beds, divided in clinician, surgical, pediatric and orthopedic ward. The hospital also has the most sophisticated equipments and it is able to perform all kinds of surgery. During our graduation, we attend to our Central Hospital, São Luíz Gonzaga’s Hospital and to the geriatric hospital Dom Pedro II, but the faculty also has convenant with the Institute of Infectology Emilio Ribas, the psiquiatric hospital CAISM and Barra Funda’s outpatient clinic. The Central Hospital, where our incoming students are most likely to have their clerkships, has 770 beds, 50 surgery rooms, 5 emergencies subdivisions (Paediatrics, Surgery, Internal Medicine, Obstetrics, Gynecology, Orthopedics and Traumatology), Intensive Care units and all infrastructure to support diagnostic procedures and exams. All kinds of procedures are done in our faculty, including organ transplants (cornea, kidney, heart, liver and bone marrow). Neuronal plasticity in animal models of drug addiction. On buses: upon boarding a bus, you'll be charged R$3,50 and can board up to three other buses in a three-hour period without being charged a second time. On the Metro or CPTM trains: for a single trip in the underground train system, you'll be charged R$3,50. First Metro/CPTM train then bus: you'll be charged R$2,90 when passing by a Metro or CPTM station's turnstile. Once you board a bus, you'll be charged an extra R$1,20 and will be able to board two other buses in a two-hour period - starting from the first validation at the train station - without any further payment. First bus then Metro/CPTM train: once you board a bus, R$3,50 is charged from your card. Upon entering the Metro or CPTM systems, you'll be charged a further R$1,45. It's possible, after leaving the Metro or CPTM system, to board up to two other buses without any further payment in the two-hour period that starts from the first validation, depending on whether you boarded one or two buses before entering a train. Note that the discounts do not typically apply to intermunicipal buses (usually in blue color and operated by the EMTU company), although there are some exceptions. Luz train and metro station, Historic Center. The rail network, composed of metro (subway) and surface trains, is the method of transportation a tourist is likely to use the most while visiting São Paulo. The metro is modern, safe, clean and efficient; the quality of surface trains varies, but those in more touristic areas area as good as the metro. An update-to-date map of the rail network can be found in this link. Line 1 (Blue): The first metro line built runs from North to South, passing through the Historical Center. Tietê and Jabaquara bus terminals are also reachable through via Line 1 (Blue). Operated by Metrô. Line 2 (Green): The Green line runs from West to East, passing through Avenida Paulista. Operated by Metrô. Line 3 (Red): One of São Paulo's busiest lines, it runs from West to East (north of Line 2 (Green), and far more extensive), passing through the Historical Center. The Barra Funda bus terminal is on the west end of this line. Operated by Metrô. Line 4 (Yellow): Connects the Historical Center to the West (mostly south of Line 2 (Green)), passing through Avenida Paulista. It will be fully operating in 2012. Operated by ViaQuatro. Line 9 (Emerald): Runs from North to South (west of Line 1 (Blue)), crossing the entire West. Operated by CPTM. Surface trains can also be used to reach a number of other cities in the metropolitan area of São Paulo and even beyond. The fee is the same, make some of these trips incredible cheap depending on where you want to go. If you don't have a Bilhete Único smart card (see above), trains uses a simple flat-price ticketing scheme - you can get only one-trip tickets, which cost R$3,50, and allows you to go as far as you wish. Free train transfers appear as white links in the map; paid transfers as black links. The single tickets can be bought at the counters or automatic machines, which can be found in every station. Buying multiple tickets will not save you money but will save time locating a vending machine or waiting time in line, which can both be bothersome. If you plan to take buses together with trains, using a Bilhete Único is highly recommended. Typical operating hours for trains are Sunday to Friday, from 4:30AM-midnight (or 1AM Sa) or, depending on the station, up to 12:40AM. Connections on the network operated by Metrô are guaranteed only for boardings before midnight (1AM Sa), regardless of the station. Check the operating companies' website for more updated information. Daily use of public transport may be quite stressful to Paulistanos; many take more than 2 hours to get to work or school! As consequence, manners are often left aside on train and metro, and on peak hours, pushes are common. When boarding, walk as far as possible into the train after the door opens, and if you wish to wait for the next train, step outside of the boarding area immediately. Otherwise, you may end up being forcefully pushed into the train. Inside of the train, it is not uncommon to have a lot of people blocking the way to the door, even if they are not leaving the train in the next station. Unless it is a hub station, politely ask Vai descer aqui? (Are you going to step out here?) to make people move on for you to get out. As weird (or stupid) as it may seem, Paulistanos do not typically wait for people to get out of the train before getting in. If you are confronted with a mass of people outside when stepping out, walk vigorously, otherwise they may end up pushing you back. Do remember to keep on the right side of a metrô escalator in order to give way to other people in a hurry - you may be pushed aside if just standing on the left side of it, especially on the busiest hours. Also, should you sit in the assento reservado (reserved seats), be kind enough to give them up for the elderly, pregnant women, parents with babies and disabled people. Buses are the most popular way to get around the city. Even though drivers really step on it through the bumpy streets of São Paulo, buses are not the fastest way to get around. In addition, they can get really crowded. However, unlike the metro/train, they do reach every neighbourhood. Tickets are R$3,50 one way. You can pay for the ride inside the bus, or use a Bilhete Unico card topped up with credits before boarding. If paying for the ticket on the bus, simply hand over the money to the teller sitting by the turnstile, and he or she will let you pass through. Note that children under 5 years old are allowed by law to slip under the turnstile for free! If you have the Bilhete Unico magnetic card, then a single fare payment allows you to take other buses for free for the next 3 hours after touching in the card. Simply scan the card in front of the card reader, and the turnstile will be released. Most Brazilians move straight to the back of the bus when they board, which can make it difficult to get off the bus, but it's considered the polite thing to do. Also, if you are holding a large bag and standing, another person may offer to hold your bag for you. This is a perfectly alright thing to do, as they're really just being kind and polite. Use your best judgement if the offer seems like anything other than a friendly gesture. If you are carrying large suitcases, try to avoid rush-hour traffic as buses can become incredibly packed. It is not always wise to take the bus late at night, especially if you find yourself all alone waiting at the bus stop - consider calling a cab instead, or asking someone you know for a lift. Taxi ranks in São Paulo are white, with a distinctive luminous green "TAXI" sign on the roof top. Check out for the white color of the taxi rank (unless it's a radio taxi), the official license sticker with the driver's name and photo on the passenger side of the control panel, and the red license plate. There are two kinds of cabs: cheaper street-hail and radio taxi. White taxis are often found at stands near city squares and big venues. Radio taxis can be ordered by telephone; ask reception at your hotel for help to call a radio cab, or just call a company. Some companies now provide an on-line, fixed price, quote and book service. Taxis in São Paulo are relatively expensive compared to other large cities worldwide and, depending on the neighborhood, there is a risk of being overcharged if you're a foreigner. To check app. taxi fares in advance, check out http://precodotaxi.com/sao-paulo/. Unlike you may have heard otherwise, incidents of tourists being brought by taxists to be robbed are extremely rare. Taxis are one of the safest ways to get around the city, and certainly much safer than riding your own car if you are only for a few days of visit in the city. The Marginals, the freeways along Tietê and Pinheiros rivers, connect all 8 regions of the city. Cars are an important tool in the life of every paulistano. By commuting to and from work, one can spend several hours a day inside a car, stuck in the traffic. Some places can be reached only by car, and if you have to travel long distances in town, it is usually the most convenient means of transport. It is also part of the Sao Paulo's own urban culture.It is common for some middle- and upper-class young people to receive a car from their families if they passed the entrance exams for university. However, as it is the case in many big cities, getting around by car is borderline crazy if you're not used to São Paulo. Traffic can be chaotic and parking is a nightmare. It is also not so straightforward to find your way in certain neighbourhoods where streets can get windy. So be warned that visitors to Sao Paulo don't really need a car. Rotating transit policy (Rodízio): In order to reduce the congestion and the air pollution in Sao Paulo, the city council has adopted a mandatory rotating transit policy: cars whose license plate number ends in 1 and 2 cannot circulate on Mondays; if it ends on 3 or 4, Tuesday is off; 5 or 6, stay home or take a cab on Wednesdays; 7 or 8, Thursday is the unlucky day; 9 or 0, on Fridays you can walk. The prohibition is valid only on the so-called Expanded Center (blue street plates with grey bottom stripe), and for peak hours: 7AM-10AM and 5PM-8PM. During the remaining hours, cars are allowed to circulate freely. A document (such as a utility bill, a bank statement or a letter from your landlord) proving your local residential address. Drinking: Please be aware that, according to the national transit authority laws, it is illegal to drink and drive. Even tiny traces of alcohol detected in your blood (0.2g per litre, or the equivalent of a glass of wine) are enough for the police to apprehend the driving licence, apply a fine of around USD 600 and prosecute the drinking driver. The police will often search for drivers that seem to be under the effects of alcohol in large avenues and areas with an active night life - locals call this kind of searches a blitz. Parking fees (Zona Azul or "Blue Zone"): The city council charges a parking fee of R$2 for one-hour parking in some of the main streets in the central area, so be careful not to be fined for not paying the charge. Check for signs in the sidewalk and yellow lines on the pavement. There are plenty of authorised shops, newspaper stands and transit guards selling parking tickets (Zona Azul) in the streets, which have to be filled in with the car plaque number, the date and the hour of the parking and placed inside the car, on the frontal window pane. These tickets are valid for one hour only, but they can be renewed if you plan to stay longer. Only two one-hour tickets can be placed at one time, which means that you'll have to check on you car every two hours to renew them. The fee is charged M-Sa 7AM-7PM, and charging hours may vary across neighbourhoods. Driving at night: Buses stop at 1AM and the metro around midnight, so it can be tricky to get to many of the famous bars and night clubs unless you take a taxi, or... drive. If you go out at night by car, expect to pay a small fee to unofficial "car keepers" in order to park your car along the streets. This is a common use in many busy outing hubs around town, which may seem unfair given that parking your car in the streets is free of charge after 7PM, but they occasionally may check your car against stereo robbers. If the neighbourhood seems a bit dodgy or deserted, try to find a parking lot rather than parking in the streets. Valet services: Most bars and restaurants offer non-compulsory parking and valet services to customers, for which you will be charged a fee (it might be as costly as R$ 25 in upscale places). These services are often covered by insurance, nevertheless, whenever using valet services, do not leave valuables such as handbags, wallets, electronics and sunglasses in the car, as these items are usually not covered by the insurance policies in parking spaces. Fuel: At petrol filling stations, you'll notice that ethanol is as common as traditional fuels in the pumps. That is because, after the oil shocks in the 1970s, the Brazilian government encouraged car makers to develop and improve the existent ethanol-fueled engines. This policy, applied over the years, has resulted in a large number of people choosing to buy this type of car. Ethanol tends to be cheaper than petrol, but the consumption in litres is around 30 percent higher. Many flex-power cars can now be fueled with either ethanol or gas, or a mixture of both in any proportion. Staff in petrol stations will fill in the tank for you, so you don't even need to step out of the car, unless if you're paying by credit card, in which case you will need go to the cashier to swipe it. Cycleway Marginal Pinheiros, with 21.2 km, is the longest of São Paulo. São Paulo is definitely not one of the easiest places in the world around by bike. Most drivers respect cyclists, but unfortunately, there are also many drivers (including bus drivers) who don't. Most of the city is flat or moderately steep, with only the extreme north part of the city being extremely hilly. The basic "survival tips" are: use a helmet, follow the direction of traffic at all times, watch out for car doors opening without warning, never ride in freeways, and use a cycleway whenever possible. There are public bicycle parking lots in many metro stations (06:00-22:00 daily), and in some it is also possible to borrow a bike using a credit card. Check the Metrô website for an up-to-date list of stations with infrastructure for bicycles. Parking lots (mainly the ones designed for cars) may not accept your bicycle, so if you are to chain yours to a pole, use a good chain with a strong lock. In metro/train stations, cyclists are allowed to put their bicycles on escalators to go up, but not to go down. As a foreigner it is complicated to register at ciclosampa.com for renting a bike with your credit card. At Ibirapuera park near gate 3 (Portao 3) it is possible to rent a bike for R$ 5 per hour. You get registered with your passport. It has become a popular place for locals as well, with hundreds renting bikes on Saturdays and Sundays. São Paulo has about 55 km of cycleways; some of them is displayed are this map (the map is not kept up-to-date, and does not display all existing cicleways). On sundays, it is also possible to use the Ciclofaixa de Lazer (see #Do section). The cicleways that cover more than one region are listed below; others are described in the individual district sections. Cycleway Marginal Pinheiros, from Cidade Universitário to Jurubatuba train stations. 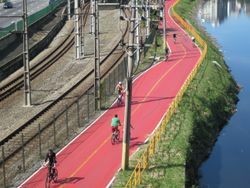 The longest cycleway of São Paulo, running in the east shore of the Pinheiros River and linking the West, South Central and Far South regions. Offers very nice views of the city, although the bad smell of the river may take some time to cope. The only problem of the cycleway is that it is isolated from the city by a train line and a motorway, so it is only possible to enter and leave the cycleway at specific points. 21.2 km. Cycleway Radial Leste, from Tatuapé to Corinthians-Itaquera train/metro stations. Goes from the middle of the Southeast to the middle of the Far East regions, running in parallel with the Line 3-Red metro line and the Radial Leste avenue. The cicleway gives an extensive view of suburban residencial areas in São Paulo's East region. 12 km. Although required by the national transit law, pedestrians are definitely not the priority in Sao Paulo, where cars dominate the streets and roads. Take care whenever crossing the streets, watching out for cars that may come unexpectedly, even if the pedestrian lights are green. Do not try to cross large roads with a high volumes of car traffic: usually there will be a pedestrian viaduct or bridge at some point in the sidewalk. Despite the aggressiveness found in the transit, one can still have peaceful walks across town. The Historic Center area and Avenida Paulista are definitely places to be explored on foot. Check the individual district listings for other nice walks. Sao Paulo is like a mosaic with many different neighborhoods like the asian (Liberdade), Middle eastern (Paraiso), German (Brooklin), Italian (Bixiga) and so on, the financial center is concentrated in three great areas Downtown, Paulista (also a cultural and gastronomic area) and Faria Lima-Berrini (which are modern neighborhoods with skyscrappers, glassy buildings and fancy malls), we also have parks (Ibirapuera, Parque do Povo, Vila Lobos), bothanical gardens, theaters, museums, restaurants with the best of Brazil and the world, bar, nightlife is awesome here and its easy to spend the whole night in a place just parting. It is worth seeing the Benedito Calixto Square (mixture of flea market and hipster products), Liberdade neighborhood (Asian neighborhood good for restaurants), Paulista Avenue and Jardins neighborhood (theaters, bars, club, shopping, cafes, cinemas), Vila Madalena neighborhood (bars, and indie places), Vila Olimpia and Augusta street (nightclubs), Horto Florestal, Zoo, Bothanical Gardens (for nature) and also plan a trip to Rio, it is close and not expensive. Avenida Paulista (Paulista Avenue) is one of São Paulo's most popular postcards, as it is the pride of Paulistanos. It is one of the largest business centers, and probably the largest cultural region in the city. Its architectural contrast reflects the fact that the avenue is located between the "old" and "new" parts of the city. The avenue and its surroundings, such as Rua Augusta, Alameda Santos and Rua Oscar Freire, contain numerous shop galleries, art galleries, theatres, movie theaters, pubs, hotel, coffe shops, bookstores, and gourmet restaurants. Gay nightlife is intense on Consolacao and Haddock Lobo Streets. São Paulo Downtown, Vale do Anhangabaú. 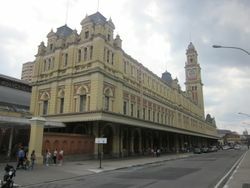 São Paulo's Historic Center met a period of degradation, but it is gradually recovering with recent projects and investments. Even though it still has some problems, it is an area to not be missed due to its historical and cultural value for the city. Here you can find many constructions and landmarks from glorious moments of São Paulo's history, ridiculously crowded commercial areas, and a multitude of theatres and cultural activities. Regarded as an "ugly and gray concrete jungle" even by many Paulistanos, São Paulo's city center indeed does not conform to a standard definition of "beauty", but nonetheless, it has become a source of inspiration for countless artists and photographers who can see on it much of the personality of the city. 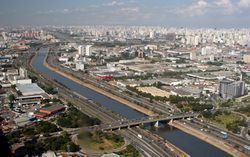 The Pinheiros river crosses the West of São Paulo in North-South direction, and although heavily polluted, the river and its shores are among the most beautiful and interesting areas of the city. The East shore is filled with skyscrapers that compose the business centers of Brooklin Novo and Vila Olímpia, and contains the longest cycleway of the city, as well as one of the most vibrant nightlife areas. The West shore is home to University of São Paulo and exhibits a stereotypical portrait of São Paulo's social inequality, contrasting luxurious appartments and mansions with low class suburbs and favelas. In the middle of the river, stands the magnificentPonte Octavio Frias, more known as Ponte Estaiada. The Line 9-Emerald train line runs alongside the river, making all spots quite easy to reach. Parque Estadual da Cantareira, Núcleo Cabuçu (Guarulhos). 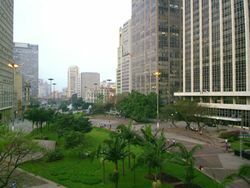 Although São Paulo is commonly associated with gray, concrete, and lack of green space, the Atlantic rainforest still covers large portions of the city and even of the municipality. These green areas are constantly under threat by irregular ocupation, so the government has turned many of them into into public parks in order to better protect them. Ecotourism parks are those which are mostly covered by the Atlantic rainforest and other natural ecossystems, and contain limited recreational facilities. They are suited for those seeking an adventure. 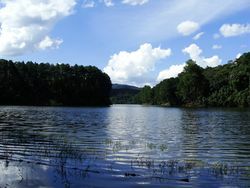 These include Parque Estadual da Cantareira (see São Paulo/Northeast and Guarulhos), APA Capivari-Monos (see São Paulo/Far South) and Parque Estadual do Jaraguá (see São Paulo/Northwest). Mixed parks are a mix between the two above types: they have both leisure facilities and preserved nature areas. They are a nice option if you think that nature is best enjoyed with the company of other people, or if you want to do something more relaxing and less adventurous. These include Parque do Carmo, Parque Ecológico do Tietê (see São Paulo/Far East) and Horto Florestal (see São Paulo/Northeast). Represa do Guarapiranga is not exactly a park, but a huge dam where there are recreation areas with nature mostly preserved. On weekends, some families go there to practice nautical sports like riding jetskis , wakeboard and some sailboats . There you can rent some of these boats and enjoy an almost bucolic landscape in the middle of the concrete jungle(see São Paulo/Far South). Check the individual district listings for a more comprehensive list of parks and more detailed information. 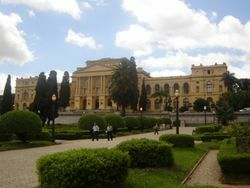 Museu do Ipiranga (Museu Paulista da USP). As the art center of the country, São Paulo offers inumerous museums and cultural centers. Two museums to not be missed, due to their size, architecture, and historical importance, are Museu do Ipiranga (Southeast) and Memorial da América Latina (West). Appreciators of art should also check Museu de Arte de São Paulo (Paulista), Pinacoteca do Estado(Downtown), Instituto Tomio Ohtake, Museu de Arte Contemporânea (West) and Museu de Arte Moderna (South Central). Check each district section of this guide for a comprehensive list of museums. São Paulo is a beautiful city seen from above, so spare some time to go to one of the few points where you'll be able to see how far this city extends to, specially at sunset. Our Local Comitee is growing faster every year nowadays we have around 20 members who work hard to make it better every day. We are very friendly and eager to help our community over our campaigns and to host as many foreigner as we can! B welcome to São Paulo! !